Tell him anything but that he can't carve something. Anything. One person did that and just look what happened. Now there are lots of little people running around an imaginary village. Well, it was imaginary . . . 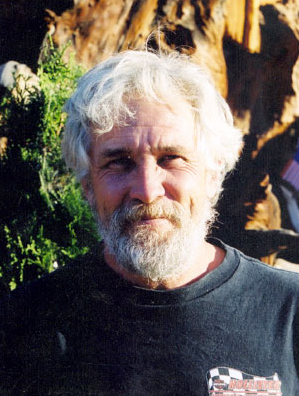 When Steve Blanchard was learning his craft, his first carvings were miniature redwood trees. Other carvers were doing similar creations, so Steve decided he wanted to make his stand out by adding tree limbs. Naturally, a fellow carver and mentor told him that wouldn't be possible to do. It just wouldn't work. But while his comrade was busy carving a squirrel, Steve Blanchard worked the limbs into his miniature tree carvings. Then he moved on to bears, eagles, Indians, wood spirits, benches, dolphins, seals and whatever else he could uncover in the gift box. Fifteen years later, those tree limbs evolved to one-of-a-kind tree houses that you have to see to believe. Then the tree houses grew to a whole village called Itsyville. But Steve wasn't always so fortunate with his.er.uh.trail-blazing attributes. That rebel spirit seemed to stand between him and any sense of true direction for the better part of his teen and early adult years. From struggling through reform school to being in the Marine Corp., the construction business, the field of oil burner servicing, the area of aluminum siding application and the shrimp boat industry. He also worked for a sound company out of Miami that toured with the likes of Dickie Betts from the Allman Brothers, Lynard Skynard and the Isly Brothers. Then he started his own sound company and began promoting local music talent in Naples, Florida, finally working his way up to a major concert in which he went broke over night! With four hundered dollars in his pocket, he moved from there to the small mountain town of Three Rivers in the Sierras. where he worked odd jobs until another venture posed itself. There he started his own nursury, (Sierra Garden Center) which is still there to this day. It was a long journey to find his calling, and not just from one coast to the other. "For most of my life, I'd never felt like I fit in anywhere until I started carving, which I believe was a gift. Like God had mercy on me and said, 'Here. Do this.' From then on, I had an identity. What a relief that was." He never married, though he says he came close a couple of times. Niether did he father any children. Maybe that's why Itsyville happened-- and why it is now the focus for his up-and-coming children's book series. A series that reflects the world of his boundless imagination, but yet imparts invaluable character lessons and tidbits of uncomplicated wisdom to its readers. "I still maintain a rebellious spirit, and maybe there's magic in that. " The rebel carver and Itsyville creator bases his shop, the entire village of Itsyville and his imagination out of Salinas, California. For a peek at his latest creations, visit www.blanchardwoodsculpture.com or come by to visit W.C. Fields, George Burns and other Itsyville residents in person. When asked if there's a carving that he still wants to do . . . "I'd like to add James Dean to the list," he says with a sparkle in his eyes.